With the ConversionCalc Plus Professional Conversion Calculator, you can enter and convert everything from very large units to micro- and nano-units — kilograms and tons, drams, scruples, grains, microliters, even tablespoons and cups. Virtually any conversion is at your fingertips with this professional conversion calculator. It's ideal for health care professionals, scientists, pharmacists, nutritionists, lab techs, engineers, specifiers, and importers/exporters. Metric and U.S. Standard Linear and Area Units: Linear and square decimal and fractional feet-inch fractions-yards, meters, kilometers and more. Volumes: Gallons, fluid ounces, tablespoons, minims, liters, microliters, acre feet, board feet, standard and metric cubic volumes, and more. Weights: Convert between tons, pounds, dry ounces, metric tons, grams, kilograms, nanograms, micrograms, grains, scruples. The ConversionCalc Plus is a powerful and easy-to-use handheld professional conversion calculator that provides more than 500 conversion combinations using 70 built-in Standard, Metric and other units of measure. Work in and convert between linear, area and volume units, plus weights, temperatures, velocity, flow rates, pressure, torque, energy and power. Don’t waste time looking up tables in books and online. Get quick, accurate solutions for all your professional conversion needs. With the ConversionCalc Plus you can enter and convert everything from very large units to micro- and nano-units -- kilograms and tons, drams, scruples, grains, microliters, even tablespoons and cups. I find the ConversionCalc Plus calculator very useful and I have started letting my Pharmacy Tech students use them. We use the calculators to convert everything from kilograms and tons, drams, scruples, grains, microliters, even tablespoons and cups. Virtually any conversion is at our fingertips with the ConversionCalc Plus. It makes it so much easier for the students because there are no charts to look up, and they can calculate medications in seconds. My students will continue to use the ConversionCalc Plus calculator. Very nice professional conversion calculator. I purchased it for my work as a mechanical engineer and liked ot so well my boss purchased them for the entire department. I use it mostly for unit conversions from metric to inch and for fraction conversions. This is an updated model of the Ultimate Measure Master Calculator (Model 8025). It has all the features of its predecessor; it has a lot more conversions not present in the former model. This calculator is fantastic for hobbyists, health care professionals, surveyors, etc... no need to memorize how to convert "A to B". It's built-in! It's a FANTASTIC Conversion calculator! Excellent conversion tools, great value. The only thing missing is a conversion to/from nautical miles. And I was a bit disappointed that this doesn't come with the Armadillo Gear case. Still, I'm a very satisfied customer. This is the first conversion calculator I have owned and I don't see any reason to ever upgrade. I am both a cabinet maker and a hobbyist gourmet cook. In my cabinetry shop I am constantly having to add measurements and divide by another number. This conversion calculator is saving me hours of hand written calculations. For example, I am able to add 11-9/64" to 4-3/16" and then divide the result by 3. I can do that calculation with this conversion calculator in just a few seconds verses having to do it longhand on paper. In terms of being a hobbyist gourmet chef, most of my European cookbooks use metric measurements. This calculator allows me to convert to traditional American measurements easily. Also, if I am doubling or tripling a recipe, this conversion calculator allows me to convert 9 teaspoons to tablespoons. 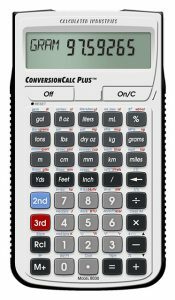 This conversion calculator is in the mid-price range for conversion calculators but I can't find any reason to upgrade. This calculator does it all! It's easy to use - I haven't had to read the instructions because the calculator is intuitive.